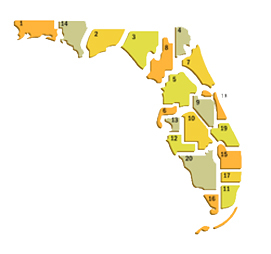 Until 1973, Florida had more different kinds of trial courts than any state except New York. A movement developed in the late 1960s to reform this confusing system. 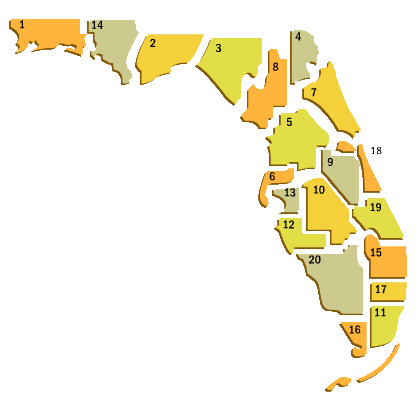 As a result, Florida now has a simple two-tiered trial court system. A temporary exception was the municipal court, which was not abolished until January 1, 1977. Most of these courts in major population areas were abolished on January 1, 1973. The majority of jury trials in Florida take place before one judge sitting as judge of the circuit court. The circuit courts are sometimes referred to as courts of general jurisdiction, in recognition of the fact that most criminal and civil cases originate at this level. The Constitution provides that a circuit court shall be established to serve each judicial circuit established by the Legislature, of which there are twenty. Within each circuit, there may be any number of judges, depending upon the population and caseload of the particular area. To be eligible for the office of circuit judge, a person must be an elector of a county within the circuit and must have been admitted to the practice of law in the state for the preceding five years. Circuit court judges are elected by the voters of the circuits in nonpartisan, contested elections against other persons who choose to qualify as candidates for the position. Circuit court judges serve for six-year terms, and they are subject to the same disciplinary standards and procedures as Supreme Court Justices and district court judges. A chief judge is chosen from among the circuit judges and county judges in each judicial circuit to carry out administrative responsibilities for all trial courts (both circuit and county courts) within the circuit. Circuit courts have general trial jurisdiction over matters not assigned by statute to the county courts and also hear appeals from county court cases. Thus, circuit courts are simultaneously the highest trial courts and the lowest appellate courts in Florida's judicial system. The trial jurisdiction of circuit courts includes, among other matters, original jurisdiction over civil disputes involving more than $15,000; controversies involving the estates of decedents, minors, and persons adjudicated as incapacitated; cases relating to juveniles; criminal prosecutions for all felonies; tax disputes; actions to determine the title and boundaries of real property; suits for declaratory judgments that is, to determine the legal rights or responsibilities of parties under the terms of written instruments, laws, or regulations before a dispute arises and leads to litigation; and requests for injunctions to prevent persons or entities from acting in a manner that is asserted to be unlawful.